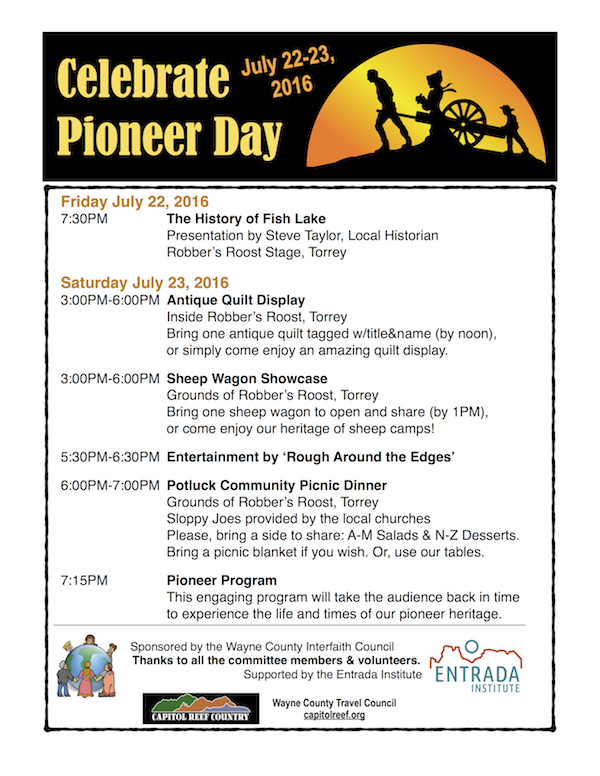 Come celebrate Pioneer Day Weekend in Torrey on July 21, 2018. 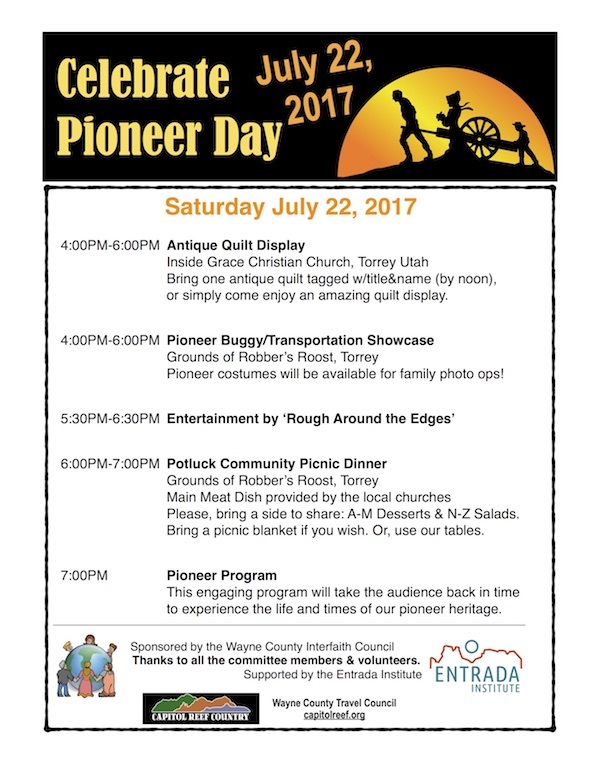 Come celebrate Pioneer Day Weekend in Torrey on July 22, 2017. This year, Pioneer Day events will be held in Torrey on Saturday July 22 events. Activities include an antique quilt display, pioneer buggy/transportation showcase, costumes, music, potluck dinner, and pioneer program. The free Saturday events are sponsored by the Wayne County Interfaith Council with support by the Entrada Institute. The Antique Quilt Display will be held inside the Grace Christian Church on Main Street in Torrey. Those interested in participating should bring one quilt tagged with a title and name to the Robber’s Roost no later than NOON for display. Contact Charlotte Williams for questions. The Antique Quilt Display will take place between 4:00PM and 6:00PM. The Pioneer Buggy Transportation Showcase will be held on the grounds of the Robber’s Roost in Torrey. Pioneer costumes will be provided for families who would like to take advantage of this photo op. This showcase will take place between 4:00PM and 6:00PM. The “Rough Around the Edges” group will be providing music and entertainment between 5:30PM and 6:30PM. The Community Potluck Picnic Dinner will be held on the grounds of the Robber’s Roost in Torrey between 6:00PM and 7:00PM. The main meat dish will be provided by the local churches. Please bring a side dish to share. Those with last names beginning with A-M bring desserts and those with N-Z bring salads. Bring a picnic blanket if you wish. Or, enjoy your dinner at one of the tables that will be set up on the grounds. At 7:00PM, our Pioneer Program begins on the Robber’s Roost Stage in Torrey. This engaging program will take the audience back in time to experience the life and times of our pioneer heritage. Enjoy an evening of unforgettable family entertainment. Over 300 people attended the Pioneer Day celebration in Torrey July 22-23. From quilts and sheep wagons to picnics and music, the event celebrated the traditional cultural heritage of Utah. It was also an opportunity to bring together a broad cross-section of the community for a positive, uplifting experience. The weekend kicked off Friday evening with a presentation by local historian Steve Taylor on the history of Fishlake. Saturday afternoon featured a sheep wagon showcase and quilt display. Visitors were able to explore a wide range of sheep camps and talk to their owners. The antique quilt display coordinated by Charlotte Williams included century old heirloom quilts along with more recent entries submitted by High Country Quilters. As festival goers arrived for the potluck picnic, the local group Rough Around the Edges provided musical entertainment. Area churches provided sloppy joes, while picnickers brought side dishes to share. The event culminated in a pioneer program coordinated by Allan and Sandy Dietlein featuring skits, readings, stories, and music. Thanks to everyone who made this event possible from both the Wayne County Interfaith Council and the Entrada Institute. Also, thanks to all the volunteers and church representatives. It’s amazing what can be accomplished when everyone comes together.